Pradaxa is a blood thinning medication used to reduce the risk of stroke and blood clots in patients with atrial fibrillation. It works by making it more difficult for platelets in the blood to stick together and form a clot. It may also be used to treat deep vein thrombosis or blood clots in the deep veins of the legs as well as pulmonary embolism or blood clots in the lungs. Since this medication does not require patient doses to be monitored as carefully as some other blood thinners it was heralded as a breakthrough when it was approved by the FDA in 2010. However, at this time there was no antidote if a patient began to experience uncontrolled bleeding. 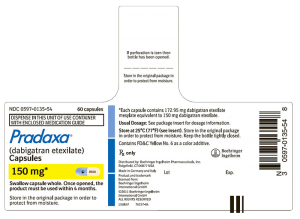 Although one – Praxabind (idarucizumab) – was approved by the FDA in 2015, several lawsuits have been filed concerning uncontrolled bleeding and other adverse events reported with its use. 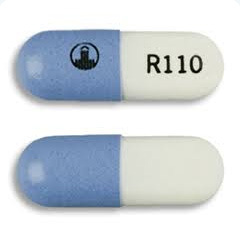 Identifiable by the unique symbol marking on the left half and the prescription strength following the letter “R” on the right. 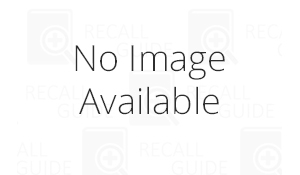 Pradaxa is available in 75mg, 110mg, and 150mg capsules. Uses: For the prevention of stroke and systemic embolism associate with nonvalvular atrial fibrillation; for treatment of deep vein thrombosis and pulmonary embolism in patients who have been treated with a parenteral anticoagulant for 5-10 days; for prophylaxis of deep vein thrombosis and pulmonary embolism following hip replacement surgery. 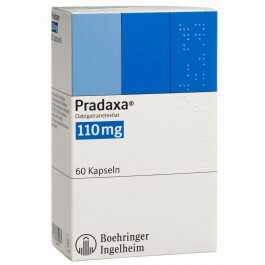 Patients who are over 75 years old or who have kidney problems, stomach or intestinal bleeding, or ulcers, or who take other medications that increase the risk of bleeding are known to face a higher risk of bleeding while on Pradaxa. This drug is also not recommended for those who have ever had a heart valve replaced. Common side effects include stomach pain, indigestion, and heartburn. More serious reactions include bleeding that won’t stop, headache, weakness, dizziness or fainting, easy bruising or unusual bleeding from any point in the body, blood in the urine or stools, coughing or vomiting up blood, joint pain or swelling, and heavy menstrual bleeding. This drug may also be linked to an increased risk of a spinal blood clot – symptoms of which include back pain, numbness or muscle weakness in the lower body, or loss of bladder or bowel control. Bleeding is the most serious side effect reported. It may occur anywhere in the body and it can easily cause disabling or deadly results. Bleeding in the heart, arteries, and veins was most common along with bleeding in the gastrointestinal system. Skin bleeding was common as well – particularly in the form of bruising or wounds that continued to leak blood even after a scab had formed. 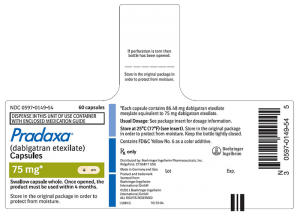 In 2011, the Food and Drug Administration received over 540 reports of patients who suffered fatal bleeding events after taking this medication. Thousands of additional reports were filed involving serious side effects. A study of these reports conducted in late 2011 also found that this drug was named in 9,029 adverse reports filed. Projections based on these numbers estimated that the risk of a fatal bleeding event was 150 in 100,000 patients. In the same year, the Institute of Safe Medication Practices estimated that Pradaxa was linked to a higher number of deaths and injuries in 2011 than any of the other 800 medications the Institute reviewed that year. Since 2011, Pradaxa has consistently ranked among the medications most commonly involved in adverse event reports filed with the FDA. A 2016 report by the Institute of Safe Medication Practices found that the FDA received 16,222 complaints related to this and similar blood-thinning medications in 2015 – even though the antidote was also approved that same year. These included 973 reports of death and 9,000 hospitalizations for internal bleeding in 2015 alone. Several thousand lawsuits have been filed in recent years after patients suffered severe bleeding, disabilities, and even death – which was more common prior to 2015 when no antidote for existed. In 2014, Boehringer Ingelheim agreed to pay $650 million to settle 4,000 lawsuits in the United States. These were filed in both state and federal courts throughout the country and were consolidated into a single case in 2012. In 2015, however, a second round of cases was filed against the manufacturer claiming that they continued to provide inadequate warnings about the risk of severe bleeding. These lawsuits typically argue that doctors would have treated patients with a different medication or would have monitored them more closely if they had been provided with adequate warnings.